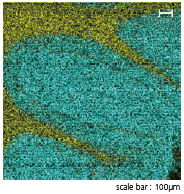 Statistical analysis allows to extract unique distribution of molecules easily. 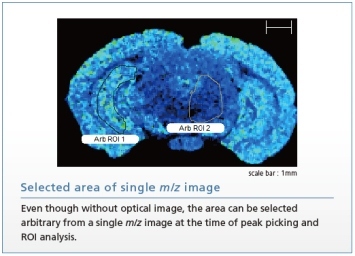 m/z image can be directly selected not only from spectrum but also from statistical analysis easily. PCA organizes all detected peaks (m/z values) based on loading factor (weight coefficients assigned to individual peaks). When the peaks are arranged in an array, the MS images can form several patterns representing principal components. Therefore, PCA can be especially useful for finding ions that show specific localizations. This feature helps provide more multifaceted data analysis. ROI analysis helps investigate and compare substances in two specified regions of interest (regions A and B, in the example above) to determine which substances are increased or decreased in each region. For example, if the amount of a given molecule increases in a cancerous region, then that is treated as a candidate cancer biomarker. HCA (Hierarchical Cluster Analysis) creates clusters (groups) consisting of similar substances from the mixture of different characteristic molecules and classifies target substances from distribution information. 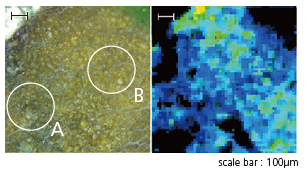 Even in case target substances are determined previously, other substances of similar distribution can be shown. 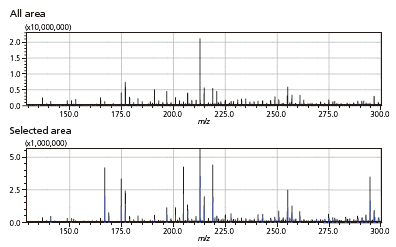 Combine and normalize multiple data for comparative analysis Enable to handle with more than prescribed number of sample points (Over 250 points on each side) Using ROI analysis function, comparative analysis between two different analytical results acquired previously is possible, which allows to find out the difference generated under the specific analytical conditions. Compatible to imzML, Analyze format after conversion to imd.format. 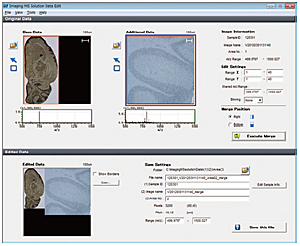 Convert data from profile (spectrum and local position) of AXIMA and MALDI-7090 and optical images, to new format available to read in Imaging MS software. Note: The above systems have upper limits of the database size. Use data edition software to reduce the size if it exceeds the limit. 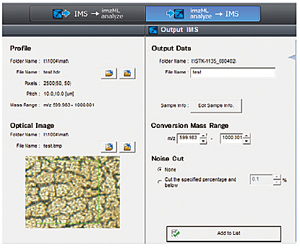 Selecting Peaks and indicating m/z image are smoothly moved from statistical analysis. On m/z image display, multiple m/z images can be overlaid. 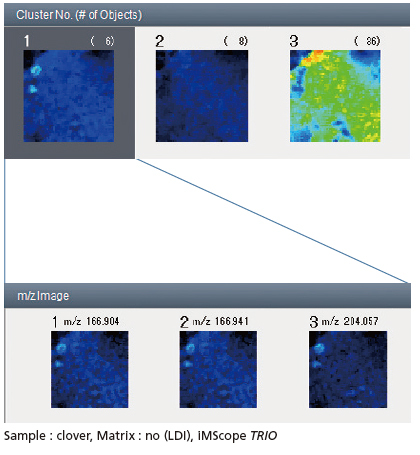 Surface of a leaf m/z image (LDI 50 μm pitch, m/z 191.4) Displaying single m/z image, area selection and spectrum comparison are possible on the screen. This product is the achievement of the program “Development of System and Technology for Advanced Measurement and Analysis” by Japan Science and Technology Agency.